This photograph is cited more than any other to illustrate the desperation and hardships faced by thousands of people in America during the Great Depression, a severe economic downturn that lasted over a decade during the 1920s and 1930s. Dorothea Lange was one of dozens of photographers hired by the U.S. government to document the nation’s struggles during this era. She photographed this young migrant farm worker, Florence Thompson, in Nipomo, California, in her makeshift tent with four of her seven children. 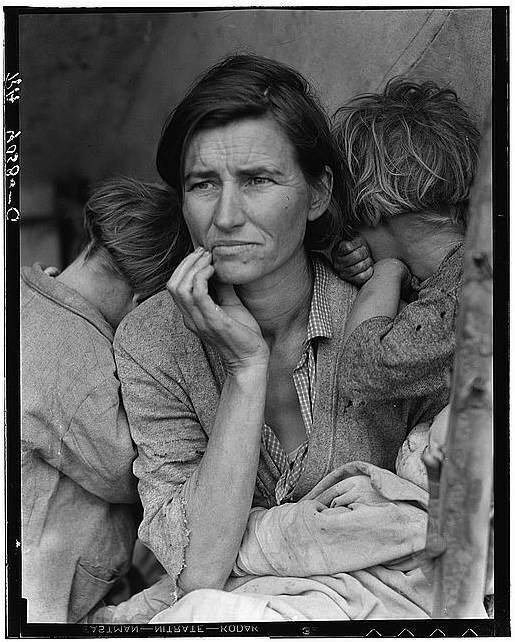 Dorothea Lange's "Migrant Mother" Photographs in the Farm Security Administration Collection: An Overview - Accessed 24 June 2010. The Power of Photography, Vicki Goldberg. New York: Abbeville Press, 1991.